When 24- year old Steve Borek died two years ago, he left his wife Teena with a farm and two young sons, Steve Jr. now four, and Michael now three. Teena says there are not many 24 year-old men who farm on their own. Shes very proud of what her husband accomplished in his short life. Teena had first met Steve when they were both working on his fathers farm. She had never farmed before that. Now that he is gone, she runs the 500-acre farm they started together by herself. But rather than talk about the seed corn, beans and potatoes she grew this year, she talks about her sons and their interest in farming. Teena not only tells her children about their father and how important farming was to him, but shows them. Little Steve has farming in his blood, she says. In their backyard, Steve and Michael play in the sand that was put there by their father shortly before he died. While Teena is trying to instill in her children a love of farming so they will remember their father and what he stood for, her brothers in law, Bobby, Joey and Tommy Borek, have given the children toy farming equipment. Pieces of equipment that could not be bought were made. Steve Borek, 4, and his brother behind him, Michael, 3, have a vast collection of farm toys, some made at home, to simulate the family farm operation. Their widowed mother believes they are having a love of farming instilled in them. Four-year-old Steve dreamed up the idea of an irrigation system mounted to his little farm truck himself. One of his uncles helped him make it. It consists of a lawn sprinkler connected to a hose and it works just like his mothers irrigation truck. The children have a facsimile of a Side-Dresser; a piece of equipment used for fertilizing that they made from a coffee can mounted onto a truck. Sixteen-year-old Uncle Tommy built them a wooden semi-truck to haul their crops in. On the south east corner of the well-dragged, well spread-out sand pile is a tire with a flag on it to designate where the field well is. 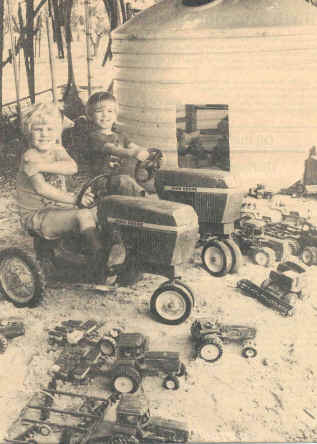 Teena had a chain-link fence constructed between her yard and her real farm equipment. The boys like to get up on the big tractors. They dont realize how easy they could fall and get hurt, she says. Steve and Michael used to climb on their mothers trucks to play with the metal disk that covers the end of the muffler, so a muffler has been placed perpendicular on their play farm, and the boys have it to play around with. Teena feels Steve Jr. has the qualities it takes to become a farmer. Even at his tender age, he will ride with her on a tractor in the field all day and not have enough. Younger brother Michael is satisfied with two hours of riding, but then at three years of age, one gets tired and needs naps. Michael is Steves crew on the back-yard farm. They spend all their time when theyre at home out there. Says Teena. One wonders if Steve Sr., were he still alive, would recognize that sand pile he put in the yard for his boys. Steve Sr. attended South Dade High School and had been farming since the age of 10. Teena hopes her sons will do the same, even though farming has numerous problems. Last year the freeze took much of her corn crop. There is an employee problem- she finds leaves and vines in the hampers that should be full of beans. But in spite of it all, Teena is making it in farming and believes her sons can too. Against all odds, Teena Boreks still farming. Steven Borek was a farmer. One of Joe Boreks five sons, he was part of a farming dynasty in Homestead. At 24, he could have run his 500-acre vegetable farm with his eyes closed. His wife Teena grew up in a fishing town in Newfoundland, and didnt know a fungicide from a fertilizer. She kept the books while Steven ran the farm. She was a full-time mother to their two young sons, Steven Jr. and Michael. All that changed Aug. 12, 1980, when Stevens pickup plunged into the canal adjacent to the Borek house. He died. It was 14 days before the planting season was to begin. Suddenly, Teena Borek had a farm to run. So the planting for the 1980 season went on at Steven Borek Farms. It was the first year the couple had contracted to sell seed corn and it would have been their first big year farming apart from the Borek family, in their new house on Coconut Palm Drive. It wasnt the season Borek expected, but it was a season, and there were a farm and a house left at the end. A great deal of the credit for that, she says, goes to her husbands family, especially his brothers Joe Jr. and Bobby, and to the Homestead farming community. Borek spent a lot of that first year at the Dade County Agricultural Center. Then, as now, she found advice on everything from her four crops- beans, tomatoes, potatoes and seed corn- to farm computer programs. Every major program that I go to that involves crops she works with, shes there, says Richard Tyson, an extension agent who helped Borek with nutrient sprays for her beans. Teena pulls out a long, mounted photograph of the Newfoundland fishing community where she grew up. There is water and earth and sky as far as the eye can see, and very few houses. Now you know why I like the wide open spaces, she says quietly. Outside, behind the house where patio furniture usually goes, are a dozen huge pieces of farm equipment- Oliver tractors and Amco harrows. They look like a childs set of green farm toys on a grand scale. Out here, time is measured by the plantings and the harvests. Life revolves around the land. Even romance begins here. She stayed with her aunt for three years, and returned to Newfoundland to study accounting. Halfway through the year, she and Steven decided to marry in Newfoundland. He loved farming with a passion, says his wife. The Homestead community remembers her husband every year with an annual Steven Borek Memorial Tractor Pulling Contest. While farming allows Borek to be her own boss, the work in some seasons demands nearly all her time. In South Dade, most farmers rent their land in parcels scattered across the county. Borek has acreage behind her house, in the Redland, on Krome Avenue and Kendall Drive, and near Homestead Air Force Base. She is constantly on the road, helping her two full time workers, Jose Luna and Auscenio Ramirez, and her foreman move equipment and prepare the fields. Borek is looking forward to this season, when Michael will be going to school a full day and she wont have to rush back across the county to pick him up at noon. Michael, 6, enjoys the farm, but his dream is to be a pilot. Last year, he cajoled a babysitter into reading him his fathers flight books. The people of Homestead will tell you something different. Shes a darn good farm manager, said Ivonne Alexander, vice president of the Homestead branch of Farm Credit Service, a national farm cooperative. She is also one of the first in the area to use computers, working with Joe Dalton at the research station to implement programs specifically suited to South Florida crops. In addition to her involvement in the Agri-Council and Women in Agriculture, Borek is also donating time and equipment to help extension agent Tyson with some experiments on potato farming. I have a lot of personal admiration for Teena. Says Bob Epling, president of Community Bank of Homestead, which has loaned her money over the last five years and worked with her on computerized farming. Cheers! At least one Dade grower has planted a crop. Homestead, FL- "Everybody is in the same boat," Tina Borek, a Dade County seed corn and potato farmer told THE RECORD in a phone interview, Tuesday. Borek, like most other farmers in the southern Dade Country area, lost about everything.Most of her house, made of cinder block construction, remained. "The roof leaks and the addition blew away," she said. All the windows blew out, she said, but the cleaning up process was proceeding. Borek managed to salvage a planter and get it working. 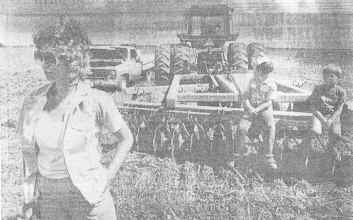 She obtained a seed corn contract from DeKalb and has already planted sixty acres. "It's nice to see something green growing amidst all the devastation," she said. "We will not make much of a crop here this year. If we had, with the fair trade agreement, we would have been hurt anyway. When asked if there was anything anyone could do to help, she simply responded "No, I don't think so. It will just take some time to clean up." She feared some illegal dumping may occur in the farmer's fields following Dade County's reinstatement of charges for the use of landfill. Borek said none of her children sustained any injuries. They spent the night Andrew came through huddled in the closet.